Before we begin, a caveat: I’m not a Legend of Zelda fan. Or rather, I wasn’t, until I started playing Breath of the Wild last Monday and finished it after four-and-a-half fourteen-hour days of gallivanting about in Hyrule, but this is to say that I am a novice in Hyrule, and have only a little knowledge of continuity or the overarching lore of the series. But that barely hampered my joy as I plugged my roommate’s (Stephan) Switch into the TV, ready to enjoy my first game in ages. It had been a grueling semester, I had a week off in between the end of classes and going to work full-time for the summer, and I was ready to plunge myself into the world as quickly and as deeply as possible. In addition to not being a Zelda fan, it’s also hard for me to call myself a gamer, since I really don’t play games much because of time constraints, but the heft of a controller still felt familiar in my hands though it’d been years since I’d played a proper narrative game that wasn’t just reflexes or strategy. And so I settled myself on the couch, awoke from a magical sleep, and proceeded to roll, jump, and whistle about this mysterious dark chamber that I (Link?) found myself in. It didn’t take long to get into the action. There was the tutorial, of course, darting about from shrine to shrine to acquire the tools needed to solve future puzzles while following the instructions of a mysterious old man who yelled at me for stealing his apples but then chuckled and said I could have them, walking through the Temple of Time (still in my underwear—it took me a few hours of gameplay to figure out how to wear clothes) and feeling a strange sense of awe in the crumbled moss, trading clumsy blows with bokoblins while I figured out combat mechanics, but soon I found myself on the roof of the temple with the old man. Then, with a touch that really made it that sort of electric, galvanizing fantasy, the old man threw off his beggar’s robes and revealed himself as the King. And of course, you knew he was gonna do that from the beginning. Any student of Lord of the Rings knows that any wise old man with a beard is a wizard or king, and if they’re in rags, that just means they’re in disguise—but isn’t there always still that little bit of you that always gets excited when it happens, no matter how obvious it’s foreshadowed? It made me scream quietly to myself at midnight as he sternly asked me—a king does not beg—to undo the evil Ganon had wrought upon Hyrule. And if I only know a little now, I knew nothing then, not who Ganon or Zelda was, not what Hyrule was like, not what Kakariko Village was, but I was still overjoyed to sail out over this bright new world and do my best to right what wrongs I could. But Breath of the Wild, unlike most Zelda games (or so I’m told), is very open-world compared to the others, and I’m very bad at directions, so I quickly got lost, which wasn’t honestly too bad. After getting a little more introductory stuff out of the way, I headed west to Hateno Village to repair the magical tablet that is your key to the world, but instead of the southern road that would’ve taken me past inns, stables, and to Hateno Village, I took a northern road through a beautiful abandoned city (Lanaryu—it drips so pleasantly off the tongue) and left me on the wrong side of a mountain range. I tried to just say “Heck it, I’m here already” and climb the somehow-important Mt. Lanaryu before backtracking, but it was too cold for Link to climb in just his boxers. Frustrated by that and not wanting to go back and waste an hour in backtracking, I ate sixteen spicy peppers (a trend I believe Skyrim started, heroes gorging themselves in times of need) and clambered half-naked over a mountain and to Hateno Village, a sleepy little town by the sea with the world’s foremost expert in ancient magical tablets. After short little scene with the expert, a little centenarian who reverse-aged herself to look like a toddler, I was off and set with the simple task of destroying Ganon, who for right now appeared as a plum-colored miasma around Hyrule Castle. And there are people that speedrun the game, flying straight from the tutorial to the final boss and beating the whole thing in about 40 or 50 minutes, which is about the time that it would take me to defeat a single dungeon, But while I knew I needed to beat it quickly, I also wanted to explore it as fully as possible, leaving with as much of a complete image of this world as I could. But then there was the thing: I was out of the tutorial and off the rails, and I wasn’t sure what to do, which I think is where the game really began to open up for me. 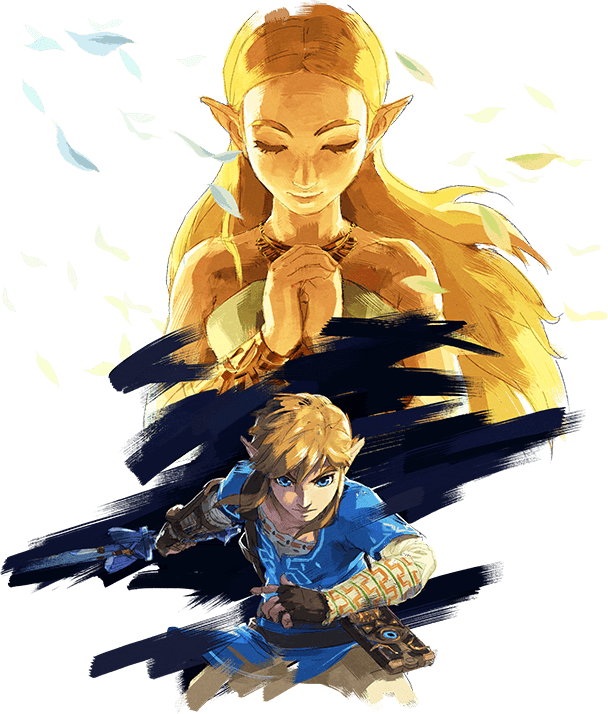 Link as a character is traditionally silent, at least according to my sources, and so, unlike the Final Fantasy series where the main characters have dialogue, Link is a blank slate for you to project yourself onto. In this game, too, he’s not only mute but amnesiac, making his own personality even less of a factor in determining what to do. My roommate, when he hit this point, started delving into side quests immediately, flitting about from town to town bearing loads of apples or goat butter to make the little people happy. A coworker I know actually did just rush Ganon, which took him about five hours of struggling and sneaking about before his wife told him there was more to the game (he’s a very straight-forward type of guy) and he made a new file to really explore. Myself, I really love exploring, so I hoofed my way across the realm to the top of each tower, which works like how they did in Assassin’s Creed—by climbing to the top, you reveal a part of the map. That may sound anti-climactic, honestly, if you think of it as a just a stunted form of cartography. But in actual terms, what that translated to was traveling into unknown, fantastical territory, having to sneak past hordes of moblins and wizzrobes tucked behind amateur fortifications or find a way through toxic, boiling mud and bottomless pits to reach the tower, which was always worth it. The view was nice, sometimes the red clay mountains of the Gerudo, sometimes the mosaic of forests and ponds of Hyrule proper, and occasionally there was a person at the top (oftentimes stuck there), but to me, it’s hard to do anything without knowing where you are and what’s around you. From up there, you could see everything, literally everything—labyrinths, dungeons, secrets of all sorts, and from my seat on the couch I could look out of my fourth-floor window and look out at my sleepy little town, the bar across the street mainly empty, the glow of a Wal-Mart in the distance, and I wonder: what secrets or hidden places lie in my own town that I’ve yet to explore? What side quests or new responsibilities, like new friends or jobs or projects, await me, that I might be able to see from here? But for now, I put them all away and retreat from the world. I have a kingdom to save and four souls to set free. Have your journeys into Hyrule been the same?